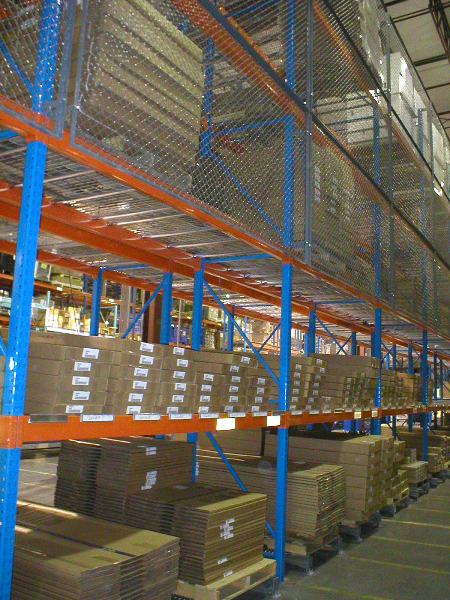 Selective pallet racking is the most common pallet racking system in use today. 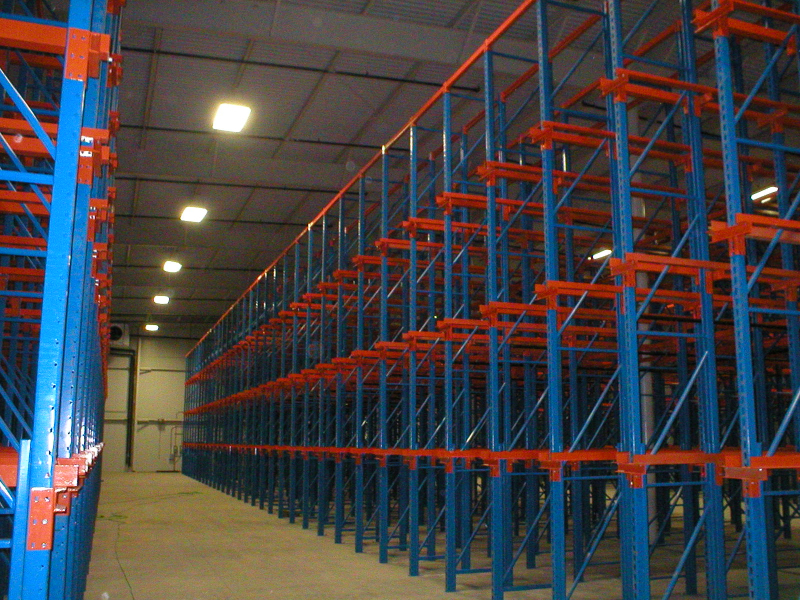 Selective pallet racking typically come in one of two configurations: a roll formed and a structural bolt-together configuration. 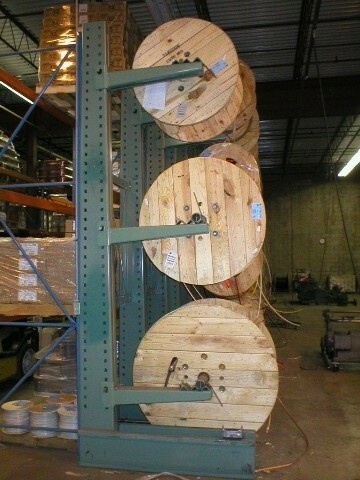 Roll formed selective rack is most commonly manufactured in a “teardrop” style (so named as the holes on the column of the upright are shaped like a teardrop). Pallets rest on the horizontal beams. 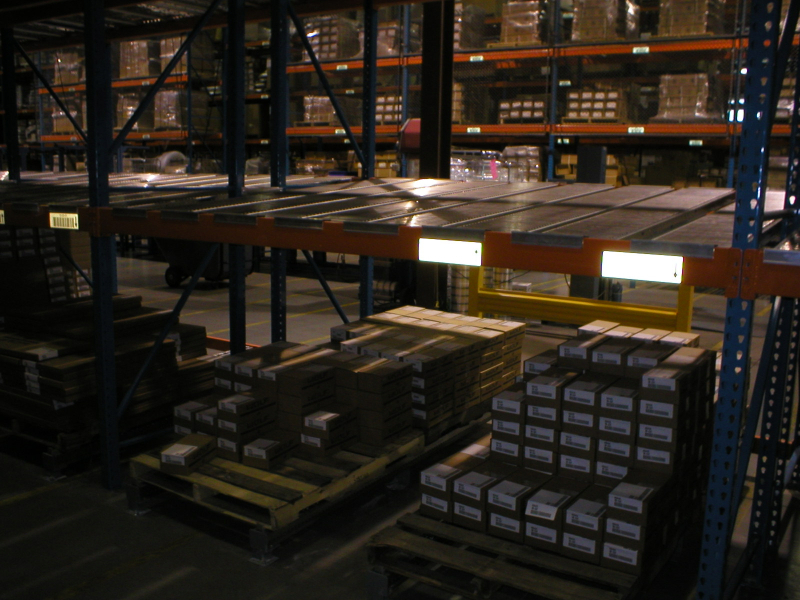 Because the beam configurations can be quickly moved, the shelves can be easily adjusted to different heights to accommodate various load sizes. 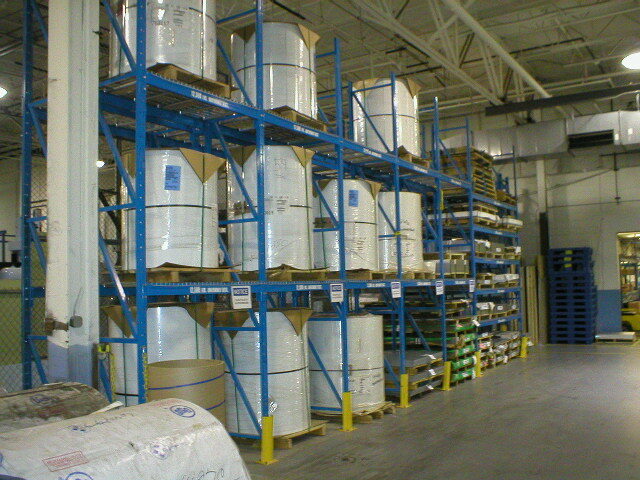 This is convenient for a warehouse that needs to store a wide variety of product sizes. 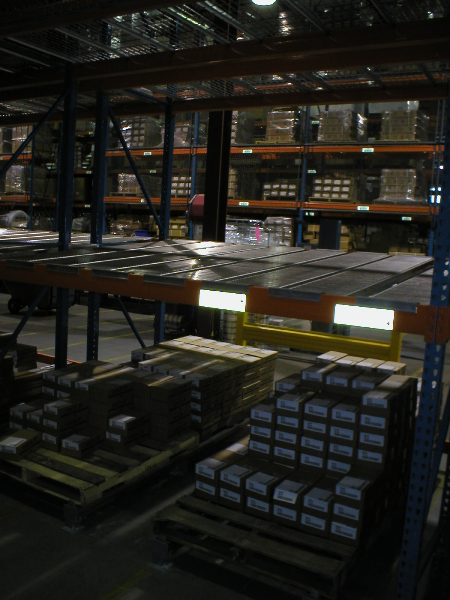 Selective pallet rack systems provide easy accessibility to all products at all times. 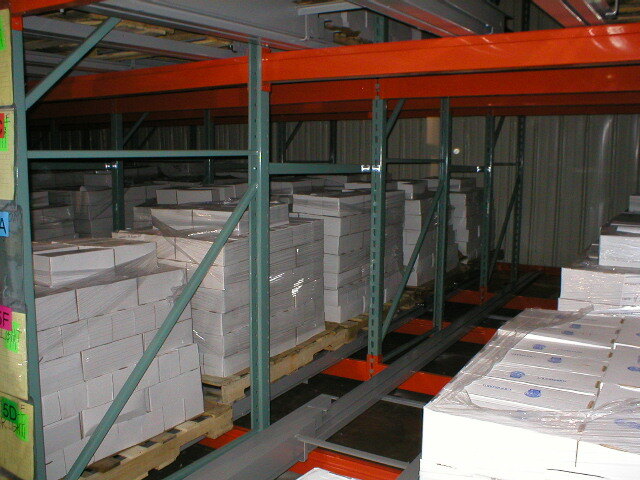 A selective pallet rack system can be used in a “big-box” distribution application, as well as in retail store inventory rooms, cold storage applications, wholesale stores, etc. 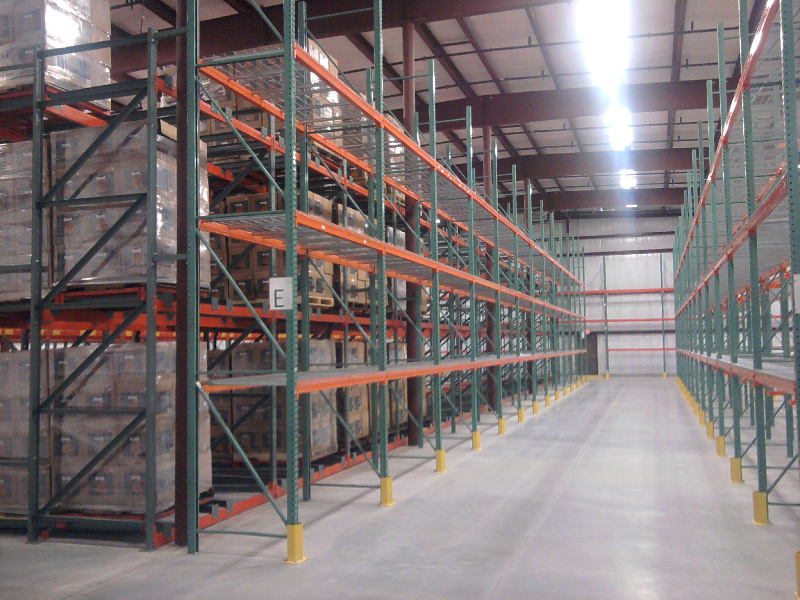 Expanding on the selective racking concept of utilizing the vertical height in a facility except pallets are stored two deep from the aisle. 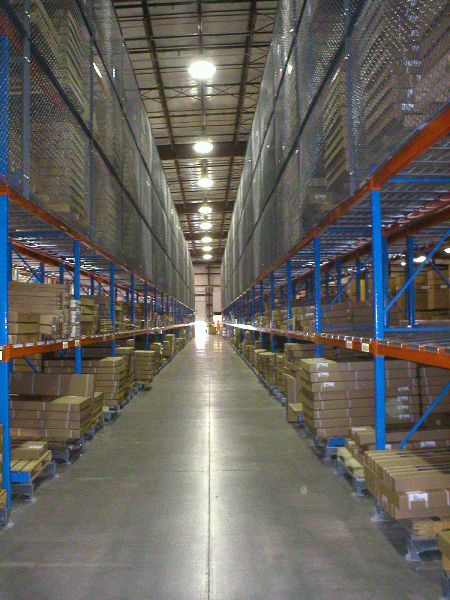 Double deep racking is an ideal way to increase pallet density while maintaining a high number of pick faces in your warehouse. 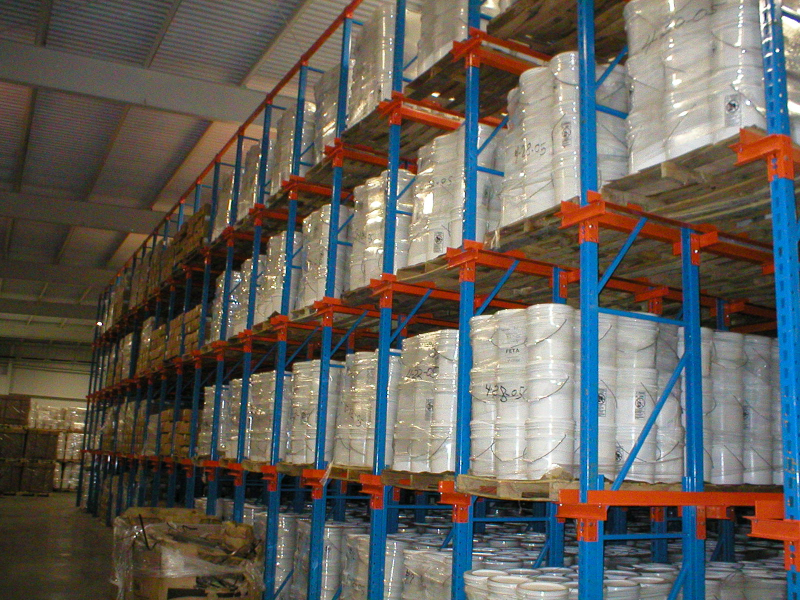 This type of racking system can be manufactured using either roll formed racking or structural racking components. 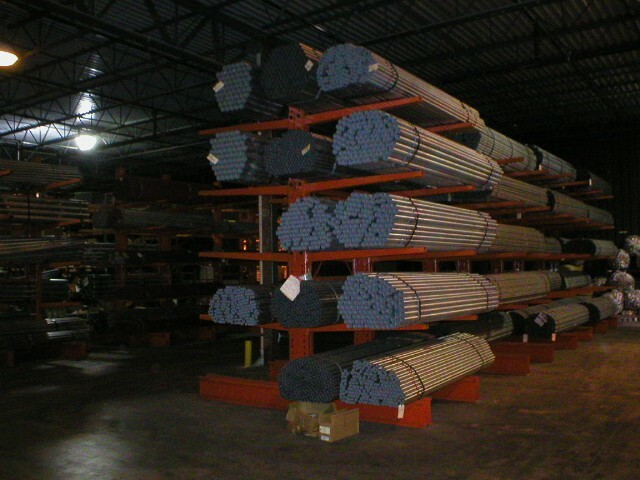 Drive-In and Drive-Thru racking terms are often used interchangeably. 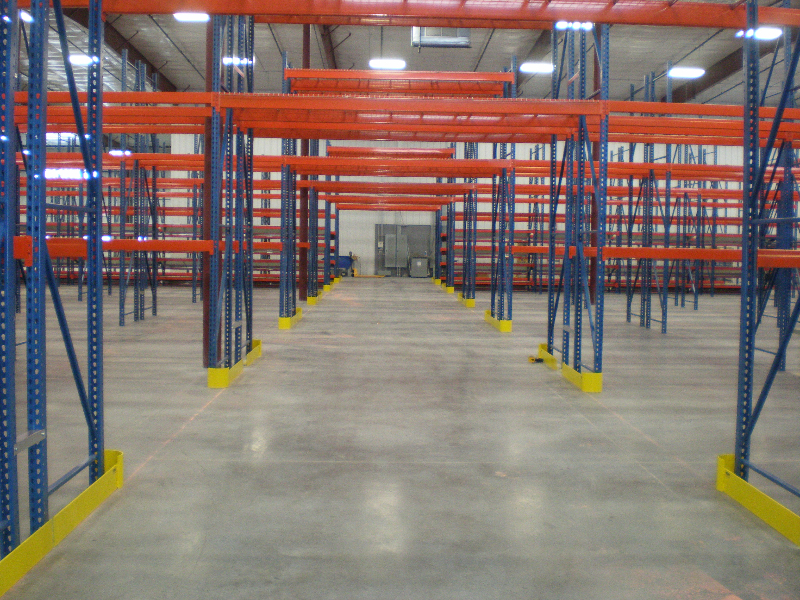 Drive-In racking requires operators to drive into the racking system from one side and remove pallets from the same entry point. 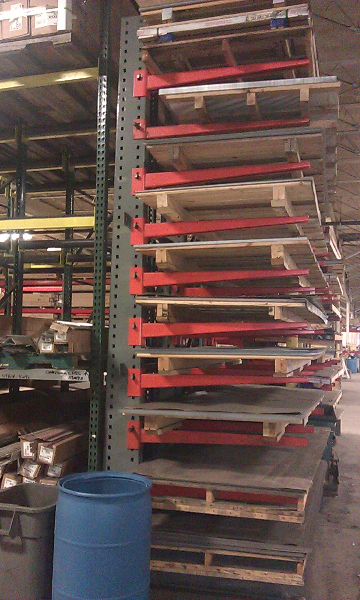 Some Drive-In pallet rack systems have a wall or are otherwise closed at the opposite end. Product is rotated in a Last-In, First-Out inventory manner because of the single entry/exit point. 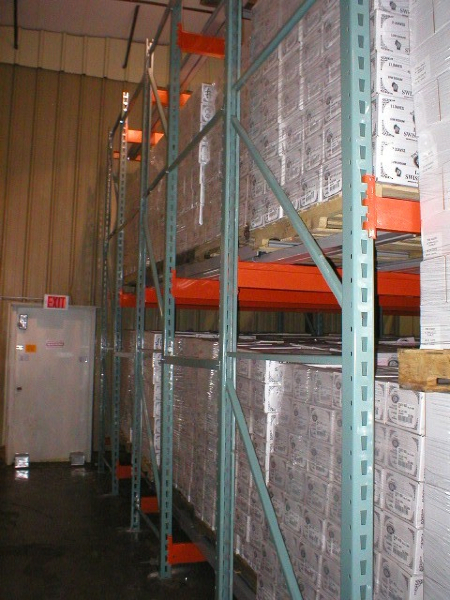 Drive-Thru racking allows operators to drive into the racking system from one side and remove pallets from the opposite side. Product is rotated in a First-in, First-out inventory manner or can be rotated Last-In, First-Out. The benefit of Drive-In/Drive Thru racking is its extremely efficient storage concentration. 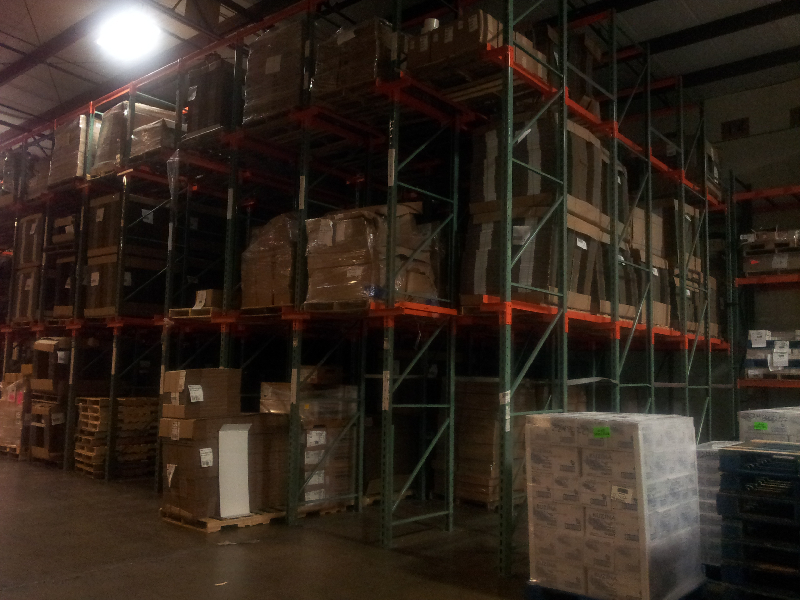 Pallets are stored back-to-back without aisles for exceptionally dense storage. 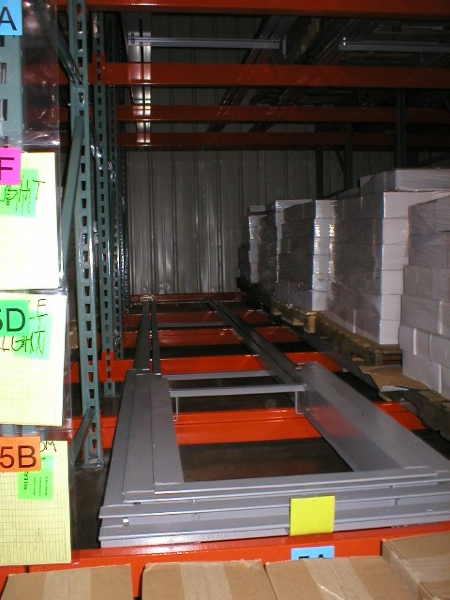 This style system is an excellent solution for product that is not time or date sensitive, or for fast moving pallets that are rotated frequently. 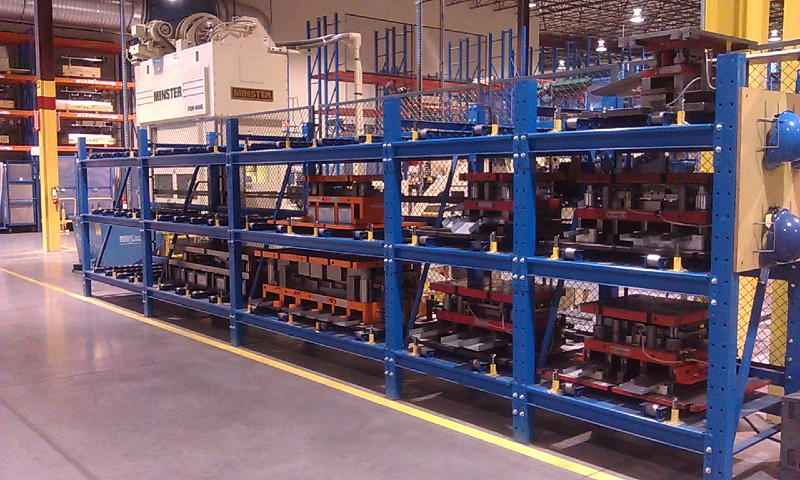 Push Back rack systems are available in structural or roll-formed frames. 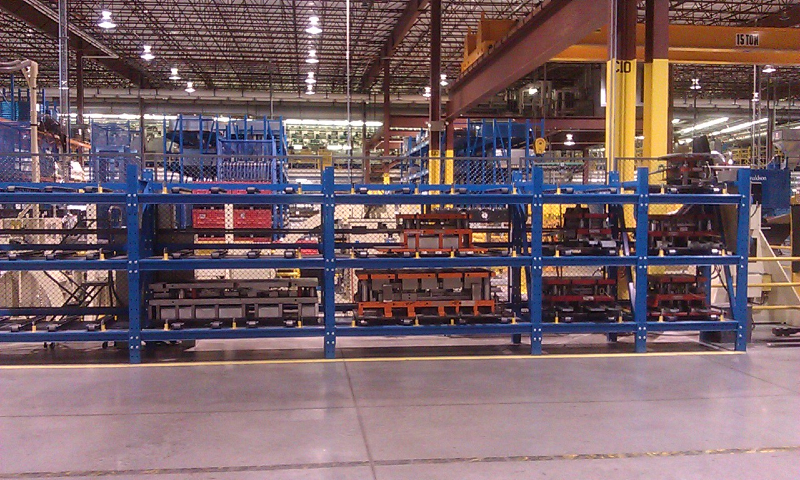 Push Back systems work by placing pallet loads on a series of nesting carts fed forward by gravity on structural steel rails. As a pallet is loaded from the front, it pushes the pallet behind it back one position. 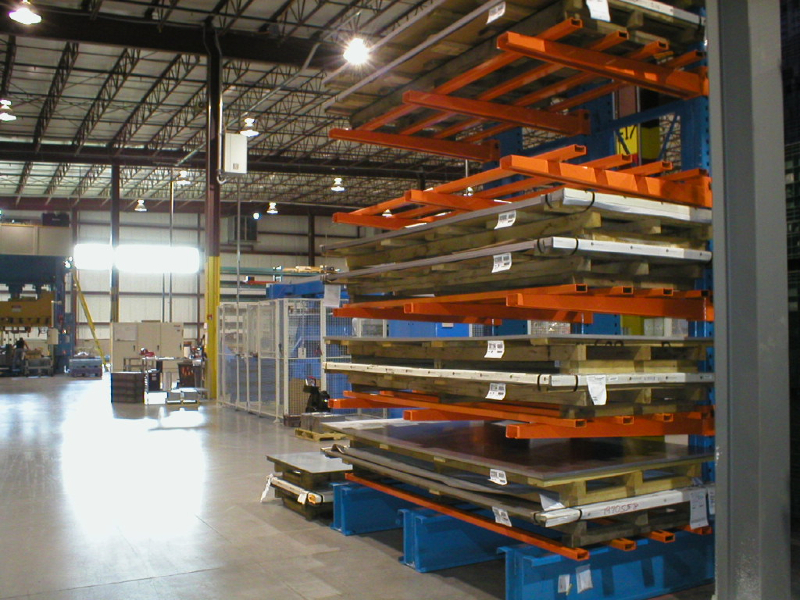 The front pallet is removed when unloading and the rear pallets automatically come forward to the front picking position. 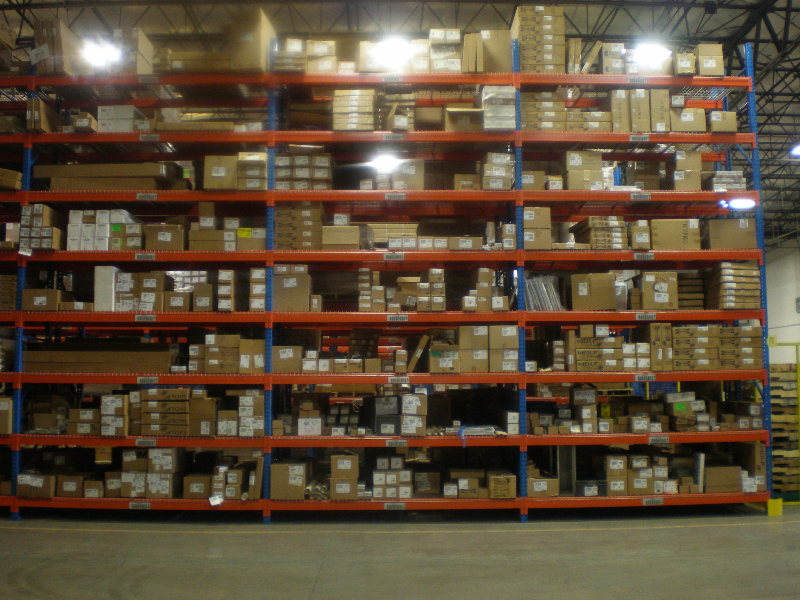 This allows for easily accessible Last-In-First-Out inventory management. 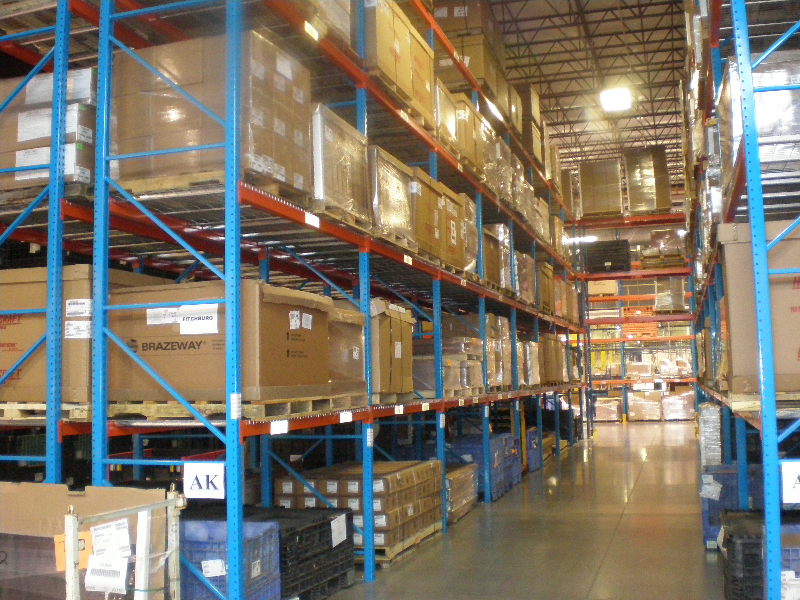 Operators can store product from 2-6 pallets deep, with front-only loading from a single aisle. Push Back offers more versatile storage than Drive-In rack because each lane flows independently and vertical storage operates separately from lanes below. 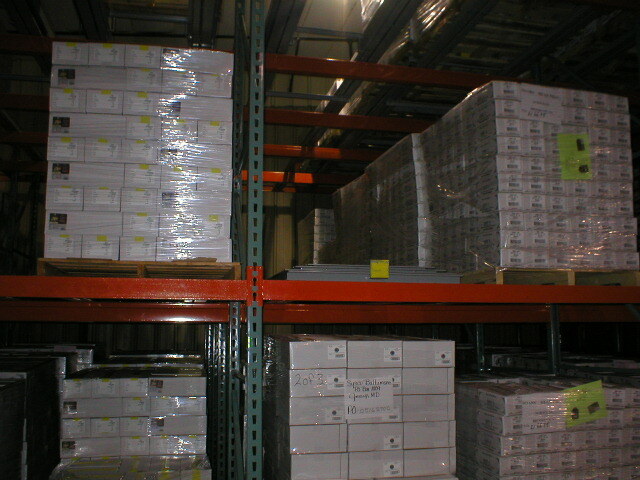 Multiple pick facings for a variety of SKUs can be stored and retrieved without disturbing other product above or below in a single-lane or double-lane format. 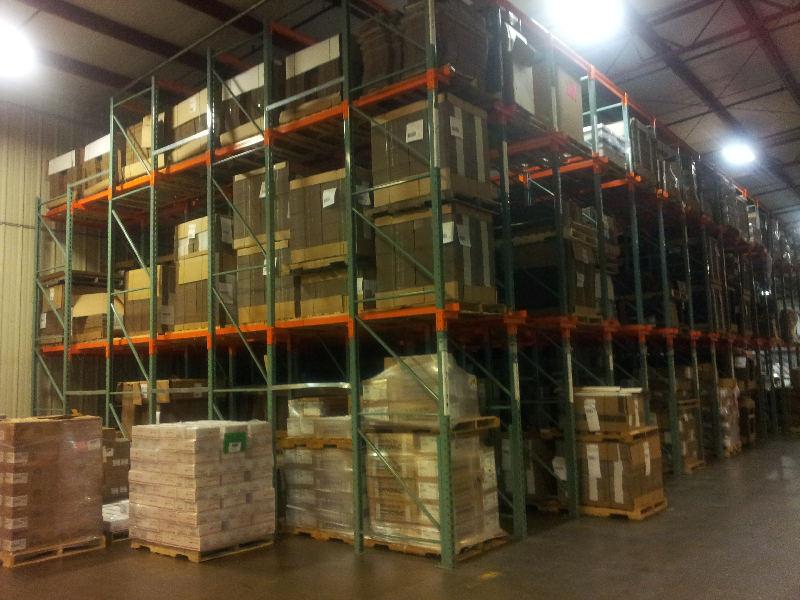 Pallet Flow Rack systems are driven by gravity. 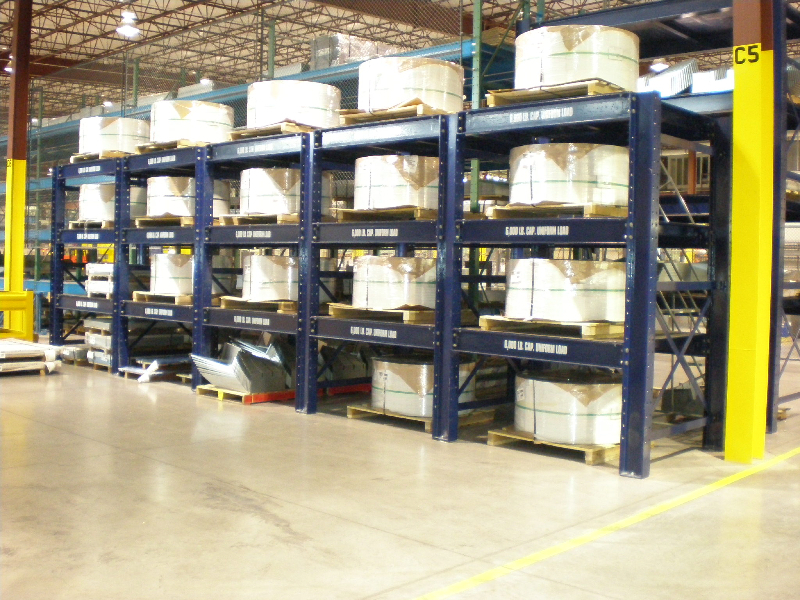 Unlike in static systems such as Drive-In racking, product flows back to a picking position and is easily accessible to the operator. 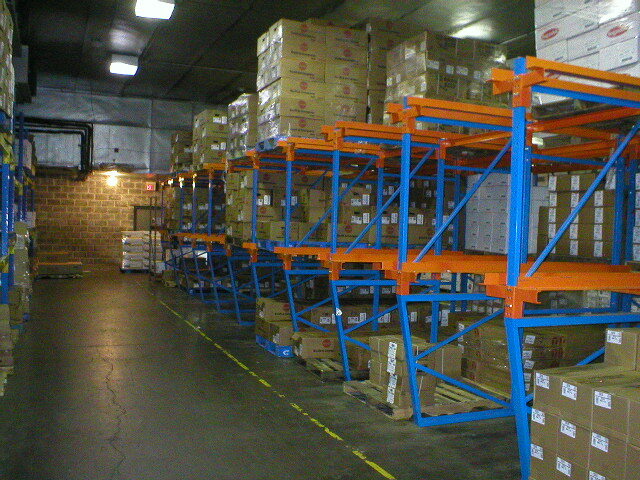 It is perfect for fast-moving product with first-in/first out (FIFO) stock rotation. 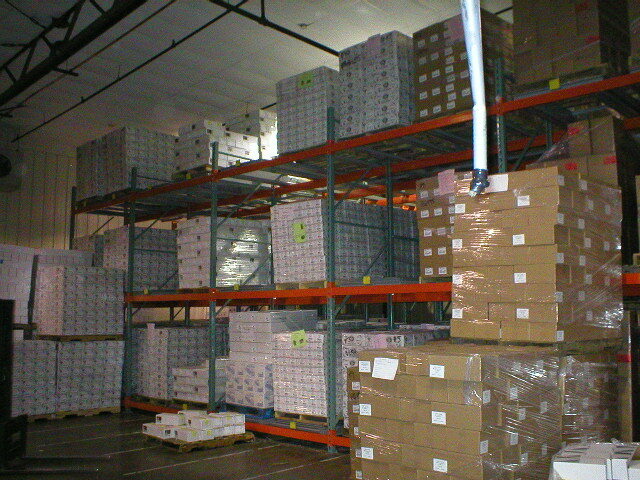 Heavy-duty skate wheels on sloped shelves allow palletized loads to flow forward for picking. 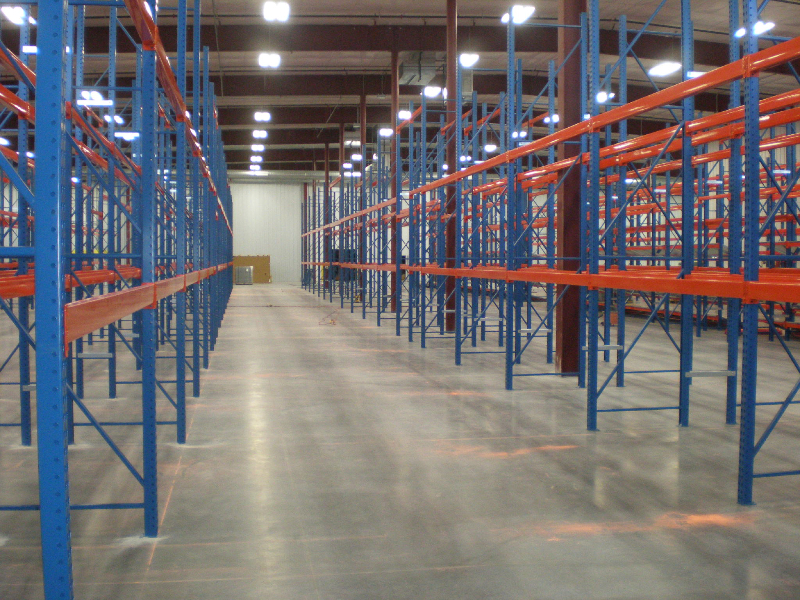 The high-density storage utilizes space with fewer aisles. Pallet Flow can send pallets through standard pallet rack or to Carton Flow Systems consisting of multi-level picking modules to split loads into boxes or piece parts. 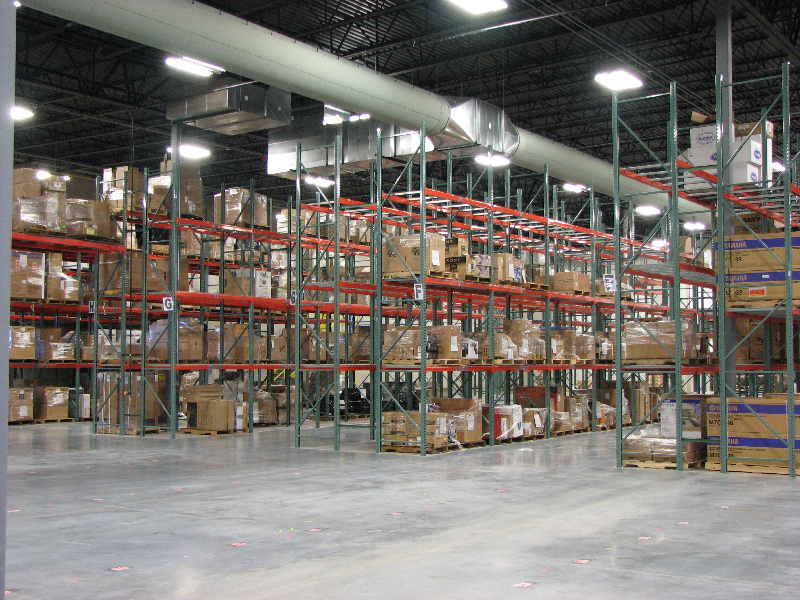 With fewer aisles by storing pallets back to back, warehouse floor space utilization can be maximized. 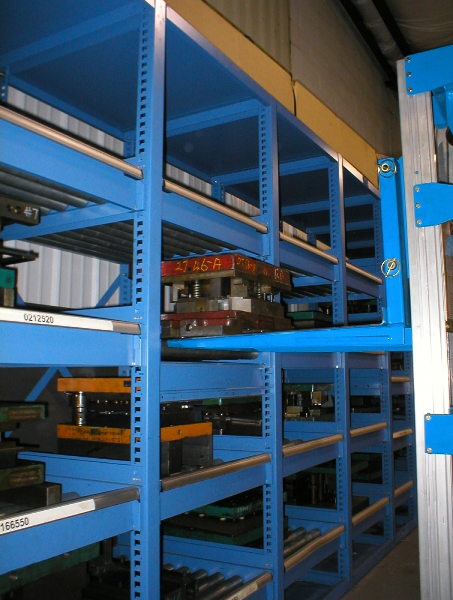 Cantilever racking is ideal for loads that require no obstruction at the pick face, so that bulky and awkwardly sized or shaped products can be safely stored and accessed. 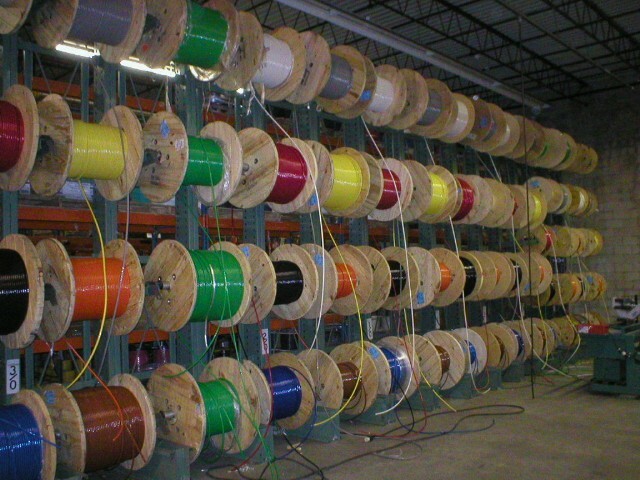 Items best suited to such a system include furniture, building materials, piping, rolls, appliances, and flooring. 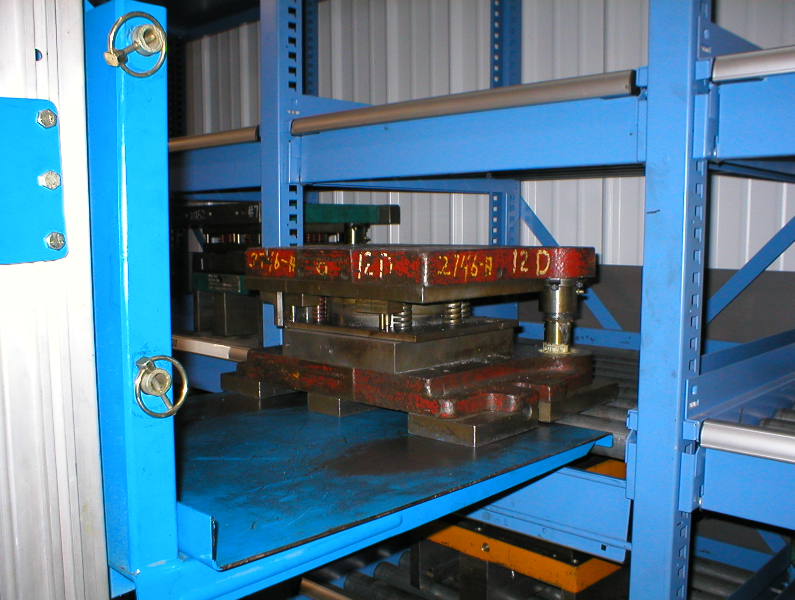 If you have irregularly shaped items, then cantilever racking is the ideal choice for you. 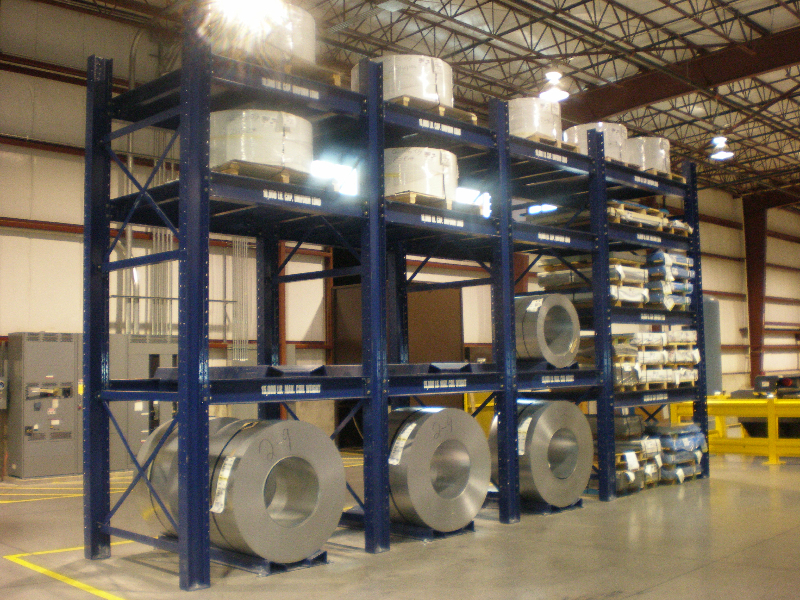 For added flexibility, loads of differing lengths may be stored on the same rack and even at the same level. 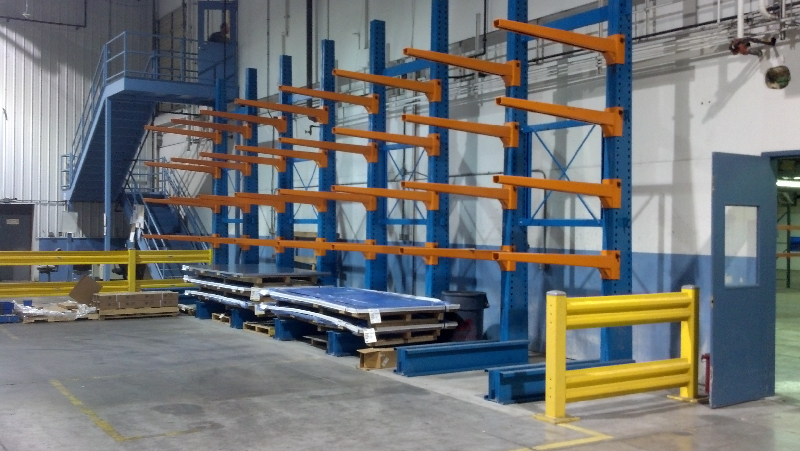 You can fit this racking system to your facility by adjusting the shelf height, ensuring that the maximum amount of vertical storage space is maintained. The support arms can vary in depth and capacity depending on the type of load. 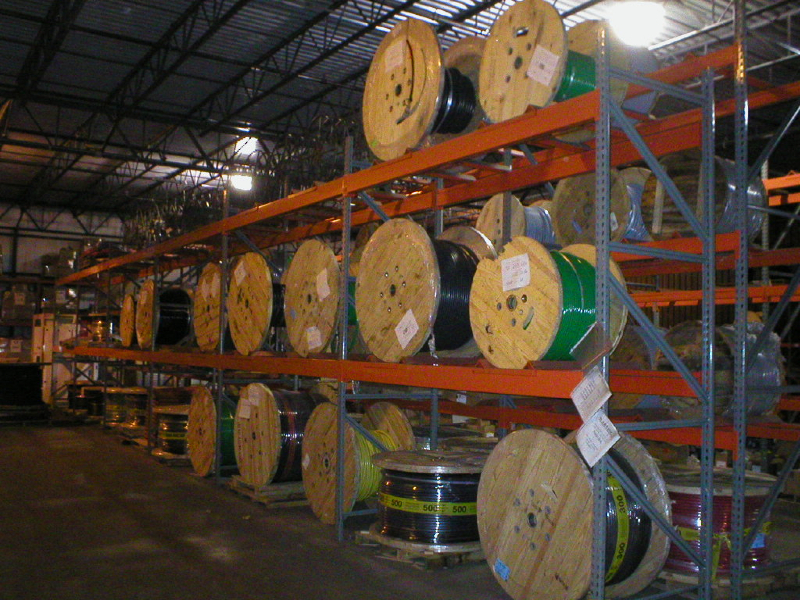 We specialize in heavy duty Coil Storage racking to suite every need of your operation. 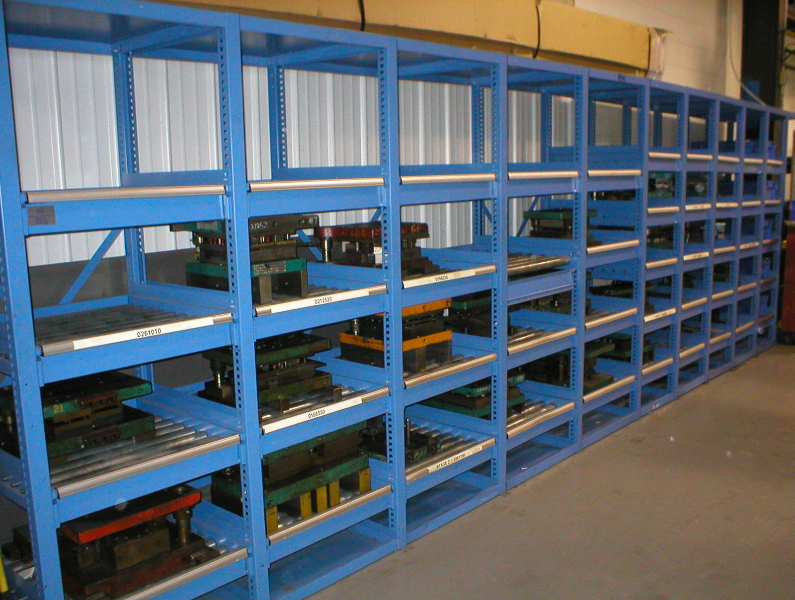 We design and build die handling equipment and die storage racking to fit your needs. Call for specific requirements.